Poetry as Consciousness-Haiku Forests, Space of Mind, and an Ethics of Freedom | Richard Gilbert | Keibunsha Co.,Ltd. This work views contemporary poetry (with illustrative examples drawn from haiku) through the lens of cognitive and literary linguistics, and depth psychology, focusing on two areas: enactments of personal philosophy and creative freedom. This work has been supported by The Japan Society for the Promotion of Science (JSPS) Grant-in-Aid for Scientific Research Kakenhi 15K02755 (2015-2018). Book publication has been supported by a Kumamoto University Academic Publication Subsidy. Richard Gilbert is a tenured Professor of American Literature at the Graduate School of Social and Cultural Sciences, Kumamoto University. In the 1980s, he studied with Beat poets Allen Ginsberg, Gary Snyder, and others at Naropa University (Boulder, Colorado). After receiving an MA in Contemplative Psychology he worked as an clinical outpatient psychotherapist; he received his Ph.D. in Poetics and Depth Psychology in 1990, studying Archetypal Psychology with James Hillman at The Union Institute & University. His book, Poems of Consciousness: Contemporary Japanese & English-language Haiku in Cross-cultural Perspective (2008), was awarded the HSA 2009 Mildred Kanterman Award for Haiku Criticism and Theory. In August 2013, The Disjunctive Dragonfly: A New Theory of English-language Haiku was awarded the Touchstone Prize in criticism. In 2017, he co‑authored Earth in Sunrise: A Course for English-Language Haiku Study. Sabine Miller started using flowers as paint/brushes in the wilds of Lagnitas, California in the late nineties. Her latest poetry publication is "Branch to Finch"(Ornithopter Press, 2016). In Review: And Why Haiku? Q1. What for you is an anarchic sanctuary? contrast with reading speculative fiction? collaboration, what are some benefits and contrasts? proximity) overrated as to social congress? sociality which values anarchic forms of sanctuary? Poetry as Consciousness will take the reader on a deep dive into the role that mind plays in the process of poetic creation. Richard Gilbert, one of the world’s leading theorists in English-language haiku, introduces the reader to a broad range of terms and concepts borrowed from such disciplines as archetypal psychology, cognitive linguistics, literary theory, neurophenomenology, philosophy, Buddhism, comparative religions, Roman and Greek mythology, as well as the ethical-technology design movement in order to broaden our understanding of the poetic process, which Gilbert describes as a “psycho-poetic landscape of thought,” a shared consciousness between poet and reader that also provides access to mythopoetic realities. After a careful reading of the challenging theoretical sections, the reader should be rewarded with a different perspective regarding why we find poetry so engaging. Gilbert then describes in detail this shared landscape of the poetic imagination as thoughtspace, a territory comprised of 7 properties and 36 qualities that he intriguingly illustrates with 216 haiku which also feature a disjunctive style. Something that should also appeal to readers is the interview-written data of poets whose words Gilbert uses to describe specific kinds of alternative communities, where, as authentic places for the poetic imagination, poets may dwell. Poetry as Consciousness invites the reader to consider the view that, through mythopoetic imagination, consciousness presents experiences of realities that enlarge who we are. To accomplish this, however, requires freedom in thoughtspace, indeed, as Gilbert argues, it is necessary to embrace “an ethics of freedom.” Poetry as Consciousness simply helps us better understand the visceral and transformative impact that poetry, and haiku in particular, has upon our lives. We need poetry more than ever, if only to recognize ourselves. 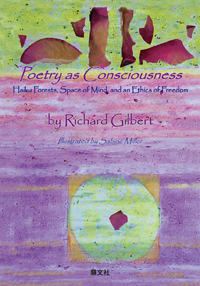 Richard Gilbert’s Poetry as Consciousness reminds us that indeed at a fundamental level we are poetry -- that the co-creative “poetic space of mind” is a primary and essential expression of our being-human in the world. Poetry as Consciousness is sublime, a compelling picture of poetry as the languaging of the creative substance and alchemy of mind and soul, as Gilbert also peers further through the veil to give vocabulary to the elusive haiku genre within the context of its role as a cognitive poetics. I believe we will continue to find how much we need this work and others in a like vein as we explore the new interior frontiers of the 21st Century. Copyright (c)2018 Keibunsha Co. All Rights Reserved. Images and bibliographic data are free when used for advertisement, introduction etc.